This month’s Mission was to go ‘no-poo’. There was a lot of interest in the Mission, but that interest came coupled with all sorts of questions. Well of course it did! Inquisitive minds are intelligent minds, and my readers are the curious-est! So I’ve written up a little faq on the no-poo hair care system, an expanded addendum to accompany this Mission. I hope it helps to clear up the confusion! What is the point of no-poo? No-poo is a method of natural hair maintenance, including cleaning and healing, to be continued indefinitely. No-poo replaces conventional shampoo and conditioner, allowing your hair to self-regulate. Baking soda and vinegar, of course! (would you expect anything else from me?) The goal is to ‘mess with’ your hair as little as possible, applying the baking soda (BS) and apple cider vinegar (ACV) once a week or less. Some people eventually remove the BS and ACV all together, and stick solely to water. Others continue the BS and ACV forever, but decrease the frequency and increase the dilution ratio over time. I’ve written in the past about harmful chemicals in cosmetics, and shampoo is no exception. Common offenders include sodium lauryl sulfate and sodium laureth sulfate, the detergents/surfactants that have been linked to all sorts of terrible troubles. There are tons of other worrisome additives lurking in your shampoo and conditioner too, variable by brand. Then of course, there’s the oil industry connection. Yup, shampoo contains petroleum products, in the form of ‘mineral oils’. These byproducts are added to give your hair that extra shine, – by coating it in petroleum! Ick. And finally, if all that isn’t enough to convince you, how about the cost? It’s just cheap ol’ baking soda and vinegar, and you use a lot less of it too. Can’t beat that! So why baking soda? What does it do? Believe it or not, water will remove the vast (vast!) majority of grit and residue found in ‘dirty’ hair. But for those tough times, BS does the rest. BS is oh-so-slightly alkaline, is a natural deodorizer, and gently scours away dirt and product build-up. Apply the BS (try it in a squirt bottle) to the roots, gently massaging it thoroughly over the scalp. Allow it to sit and then rinse in warm water to cleanse and clarify. So why vinegar? What does it do? Conditioner was invented to replace the oils stripped by harsh detergents (that’s shampoo). Without the nasty, drying, stripping soap, there’s no need for extra oils. Vinegar can do it all! ACV is mildly acidic, with about 3-5% acid content in most store brands. Most importantly, the tincture restores desirable pH. It seals the cuticle while detangling and clarifying hair. Additionally, it promotes circulation in the scalp and reduces flaking or peeling skin. No dandruff! Apply ACV (try it in a spray bottle) to the shafts and scalp. Distribute evenly and allow to sit. Rinse with cool water to soften hair, reduce frizz, and restore curls. What about the transition period? If you use normal shampoo, your hair is accustomed to being stripped of it’s natural oil. When this stops, the hair freaks out for a bit! This can cause an ‘oily period’ where the scalp is overcompensating. Just give yourself a few weeks to re-adjust. What are the benefits of all this? And that’s all there is to it . . . so what are you waiting for!? @Morgan: Wow! I wouldn’t have thought that could be enough, but I’m certainly willing to give that a shot. @ Nicole – To be honest I never shampooed my hair after dying, even when using the harsh chemicals. Is that crazy? Haha, but really a long thorough water wash was always enough for me. That said, I think ACV is a *fantastic* idea! @Sayward: I don’t know if it’s crazy. Maybe I’m crazy, paranoid. But hey, I’ve got my dye, plus all the basic supplies and a mostly-natural alternative should all else fail. I guess I’ll just have to see how it goes! Thanks for telling me how it worked for you! @Nicole – Depending on your preferred color, of course, you really should consider going natch for the coloring too. There’s red (that’s me), black, and some have success with brown even (it’s trickier though). Hennaforhair.com tells ya (and sells ya, affordably) everything you need. @Carolita: The original comment does say ditching the dye isn’t going to happen. It also says, “yes I’ve tried henna and veg.” Don’t you think that’s “consider[ing] going natch”? I don’t want to be rude, but it’s frustrating and nigh insulting to receive suggestions which whether intentionally or unintentionally fly in the face of what’s been requested. I’m not asking for advice on choosing a dye – I’ve clearly already done so. And while you didn’t get a lifetime history of my hair (who wants to read that? It’s not my blog! ), you certainly got enough info to deduce I’d examined other options. Hennaforhair.com is on the first page of results in google for the search term “henna” (and is the go-to henna website on every hair forum I’ve ever seen). If I hadn’t seen that website, I wouldn’t just be a neophyte – I’d be a dunce. So, really, while I appreciate your concern for my hair (and whatever else is presumed), it sounds like preaching and frankly doesn’t come off well. Thanks for your unbidden good samaritanism, but I’m sticking with this dye for now, just as I said I would. Whoa, excuse me for being busy and not reading all the way up the chain! I got an e-mail follow-up comment notification and was yes, guilty of laziness. But talk about preaching… Meee-OW. Whoa, excuse me for being busy and not reading all the way up the chain! I got a few e-mail follow-up comment notifications and was yes, guilty of laziness. But talk about preaching… Meee-OW. That’s not preaching at all. Preaching is normative; it is intended to give advice. I didn’t give you any. But now I’m about to tell you something that is normative: If you want to tell me I’m overreacting, rude or anything of the sort, it would behoove you to do so like an adult. The way to do that is to say something like, “I didn’t intend to offend you, so your offense is unwarranted,” not to make cat noises. And yes, I am offended, mildly, because there are a lot of assumptions involved in telling me what I ought to consider when you didn’t even bother to read the comment. And I think at least some of those assumptions are incorrect. What I was actually doing is telling you how frustrating it is to say, in short, “how can I get developer off my head while staying no ‘poo?” and receive an answer that says “you really should use something without developer.” It’s presumptuous and rude to give advice that’s specifically disinvited. And I’m not going to come back to this discussion because I think it can only devolve from here. I’ve said my piece, I would appreciate it if further discussion didn’t presume to tell me how I should treat my head (except the specific advice I asked for and was graciously given), and I have more respect for this blog than to bicker on it any further. Sayward, for what it’s worth, I apologize for rocking the boat and I appreciate your advice. I’ll be reading quietly. Will this no-poo routine work for curly hair? When I mean curly hair, I mean thirsty 1/4″, in diameter, corkscrews. I heard of the no-poo regimen is good for curly hair because the poo does nothing for dry, frizzy curls. That method was all about skipping the shampoo and using conditioner for cleansing and conditioning your hair (of course, a weekly deep conditioner and scalp scrub was included). A scalp scrub is a mixture of a tbsp. of your regular conditioner and tbsp. of brown sugar. You would a massage this mixture into your scalp to exfoliate the dead skin cells that would be sit on you scalp and hinder your hair from it full potential to healthier and grow better. Could I still do these weekly treatments if I were to do the no-poo method you wrote about in the above post? I LOVE no poo. I use bs and acv everyday for now. I switched back to shampoo briefly after we moved, but find commercial shampoo makes my scalp much oilier. Commercial conditioners also seem to make my skin break out. I use a tiny amount of liquid castille directly on my scalp when needed, and add vanilla to the acv. My hair is fine, thick, and wavy. 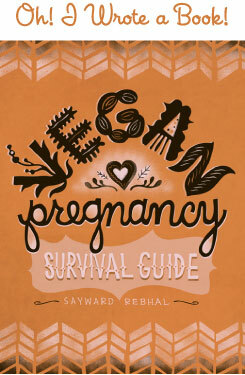 Sayward- thanks so much for the blog. It keeps me inspired! Ok, I decided to give this a try- I feel I have nothing to lose anymore. I’m having some pretty major hair issues right now as it’s super dry and falling out. My blood tests are coming back ok- thyroid, nutritional, and all of that, but I continue to lose tons of hair daily. My hair is like straw so I was very afraid of giving this a try, but I’m tired of how awful my hair looks and feels. So I did the BS/ACV today and I was very surprised at how things came out- soft, soft, soft. Easy to brush through, no tangles, not out-of-control dry straw. So I’m really hoping this continues to work for me as I strive to find the cause of my hair loss- maybe this will even help a bit! Thank you for posting this! @ Vicki – I’m sorry you’re having so many issues. But good luck figuring it all out, and I hope the no-poo continues to work for you! Ok so I have been doing the no poo for about 6 months now and love it, my hair is a bit dry but it was before no poo( I blame moving from a beach town to the deserts of Colorado) So a friend asked her hair dresser about no poo and the hair dresser said to add a little lanolin to the BS solution. So i tried it and it is very nice I only suggest doing it at most 1 time per month if you have very dry thick wavy/ curly hair. And far less often if your hair is straight, or thin. and not at all if it is oily. Now im not sure what the vegan version of this would be possibly a little olive oil/ cocoanut oil. so it takes very little to work well. I use 1/4 a teaspoon of lanolin in a 8 oz bottle of hot water with 4 tablespoons of BS. My hair feels great, I used the same ration on my daughters hair( her hair is to her chin mine is to my waist) and hers is a bit oily now but not that bad( not at all frizzy and very manageable). Steph have you tried soap nuts to wash your hair? They are suppose to work with hard water. To make the liquid, add 6-8 whole shells to 6cups water, boil and then simmer for 30 minutes. Strain the nuts and pour into an appropriate container. Use this liquid as you would your regular shampoo. 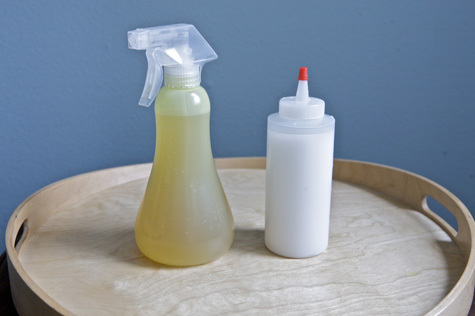 Pour a 1:1 solution of vinegar and water in a spray bottle, and use as conditioner. Rinse well and dry as usual. Shampoo bars are awesome! While I haven’t tried using BS, I have been using an all natural, handmade shampoo bar for a little over a month now. Not much of a transition period for my hair, thankfully. I just did my 1st ACV rinse today & it worked wonderfully. My hair is a little on the dry side, but I use a teeny bit of coconut oil as a leave in and that does the trick. Once my kids get a little older (1 & 4 years now) I’ll start using bars on them too, but until then I’ll keep spending a fortune on California Baby products. I also just started using coconut oil as body moisturizer for myself and both kids. I’m so loving the transition to natural products. Great blog, thanks! Very educative, i use vinegar for hair shine and it works very well! I’ve tried to read through all of the comments so I wouldn’t have to ask you, but with the BS, does one mix it with water to make a solution out of it or just pour some BS on one’s head? Then the ACV in a spritzer bottle to spray on, right? Yes you mix the BS with water and then yes the ACV in a spry bottle. Have fun i love what this has done for my hair. I’ve just started about a month ago going no-poo. I have extremely thick, spiral natural curls about midway down my back and they are normally a royal pain. For years and years I dealt with tons of split ends, and very dry almost scratchy feeling hair. I tried everything commercially I found, even paying up to 75 dollars for a single bottle! I already had stopped shampooing daily in the shower on my own, and had noticed a great difference, so after looking around for a few weeks I took the plunge and decided to go for it. Never going back for sure, my normally sand-papery hair is silky again and so much less frizzy. I use baking soda one a week, about 1tablespoon per 2 cups water is my mix. For conditioning I use diluted ACV mixed with lemon juice and lavender buds(Pluck them right off the plant and fill 1/2 the bottle up with them. They steep just like suntea in my window for a day and voila no vinegary smell to report. I’m having trouble with this – I began about 3 or 4 weeks ago but my hair has lots of build-up on the scalp. It’s very oily right at the roots, as well. It’s a little below shoulder length and pretty thick. Any suggestions? @ Em – I think the transitional period can take quite some time before it mellows out, and unfortunately that means a long “oily” period. Sorry! How often are you using the baking soda? If it’s mor than twice a week, I’d say cut back. But give it at least 6-8 weeks. Sometimes it just takes a while. I have extremely thick and oily hair that i wash everyday. I’ve tried washing every other day with scrubbing my hair under water in between and it just resulted stinky itchy greaseball mess lol. (During puberty i used to wash it sometimes twice a day, really bad i know lol). No poo sounds fab, but I’m nervous about the “transitional” phase. I work in a hotel and I can get written up for “bad hygiene” (greasy hair, not smelling fresh, looking not put together) so looking like a greaseball during transition worries me. Any fellow thick oily haired ladies wanna share their experience with me like length of transitional time etc so I kinda know what to expect? Also, lets say I go no poo, then go get my hair cut and the stylist washes my hair, do i start the “transition” phase all over? Thanks! Hi Natalia, is there any way you could wear a fashionable head scarf or wide headband or something like that – something chic and pretty but that would mask the oily period? I am growing out baby bangs right now and pretty much wore a hat/scarf for a month! If you wash your hair just once or even twice with regular shampoo it should be fine. Your hair might freak out and go a little oily, but you certainly wouldn’t be back to square one and you wouldn’t have to start all over again. try a little cornstarch sprinkling at the roots and then brush out well, it works for me! IT will make hair look dull if you use too much but it is absorbent and will help with those terrible greasy patches. Started the no-poo experiment (what a hilarious name) today by washing my hair with just water. It looks and feels pretty clean, which may have to do with the fact that I’ve been using mild organic shampoo and only washing my hair every other day the last couple of years. Do you think this might shorten the transition period a little bit? If you make your BS rinse beforehand in a large quantity, you could try boiling the water to soften it. After the water has cooled (that last part is very important – I plopped about a cup of BS into the water right after I turned the stove off and it EXPLODED on me! Live and learn, right?) but is still hot enough to dissolve the BS, add the BS sloooowly and mix until it’s dissolved. Then just go ahead and pour it into a shampoo bottle, I find a funnel really helps with this, and there you are! Soft water! Definitely! That’s what I was doing and my transition period was super short – less than a few weeks. Luck! I’ve been doing no-poo for nine months, and my hair has never looked better. I only use the vinegar in my son’s hair once every one or two weeks, and his hair is perfect. I put the vinegar in a lavender water mix that I make myself. 7 cups water, 1/2 cup vodka or witchhazel astringent, 40 drops lavender EO, and 10 drops tea tree EO. Let “steep” for two weeks. Just put it in a container and forget about it for two weeks. Old vinegar bottles work great for this. Then, I add 1 to 2 tblsp ACV to every 8 oz of lavender water. The lavender enriches and stregnthens the hair, and tea tree oil is great for dry skin and lice prevention. Also, they are both antimicrobial. I also use this mix as an all purpose cleaner, “Fbreeze”, window cleaner, facial toner, pour some in the bath water, hand sanitizer, and more. Oh yeah, I use the baking soda once every one or two weeks. Sometimes I make the paste, and sometimes I just sprinkle it on my fingers and scrub it into my scalp. I also use BS to wash my, brush my teeth, exfoliate my skin, and for cleaning of course. One more thing. Once a month, I make a paste from sugar and lemon juice, and I use it to scrub my scalp, and body, and face… But don’t do that if you don’t want highlights. I’m kind of behind on the whole no poo thing as we just discovered it, but I’ve been using Dr. Bronner’s on my hair, so just made the little switcheroonie…if you will…to no poo. Anyway, started using it on my 5.5 year old daughter and she loves the way her hair feels, but HATES the smell of the vinegar in the bath. Do you have any ideas for decreasing the smell or if I add essential oil would that help? or be not so good? Thanks so much. I’ve really been enjoying your site! I haven’t tried it personally but know people do add essential oils to mask the vinegar smell, and they’ve said it works out well. Definitely worth a try! Maybe you could also try using lemon juice instead of vinegar. Any suggestions? Brushing my hair more often maybe? Haven’t really done that very much. How often are you no-pooing? If I go more than 6 or 7 days, my hair gets very limp. You might need to do the bs more often. Yes, that might be it – I only no-poo once a week. Thanks a lot! I also think it might have to do with the relatively hard water we’ve got here. Will try boiling it next time I no-poo. Changing seasons and weather tends to affect the condition of our scalp. scalp becomes dry, scaly, and itchy. The most influential effect on climate change is dandruff, and of course also affects the quality of your hair. The following are 10 faqs about dandruff that will be described by Dr.Deepali Bhadwarj a consultant dermatologist at Rockland Hospital. I’m a beginner in this. Can you please tell how much baking soda in how much water? Can I use white vinegar instead? How often? I use about a tablespoon of BS in a cup of warm water. I think white vinegar would work as well. I do the whole routing once per week. I’ve been using bs/acv. I have wavy hair that used to be dry but now it isn’t since going no poo. My question is….How do I get rid of all this frizz?!? I have always had a lot of frizz, but I would put silicone or something else in it. What natural products can I use to tame it? And if I use any other products, will it be counter productive to the no poo method? Any help or advice would be greatly appreciated. Thanks! I’ve used coconut oil and aloe vera gel. I’d love to hear other people weigh in too!